TRY VRV FOR FREE RIGHT NOW: http://www.vrv.co/geekdom | What are the TOP 10 BEST Frieza Moments in Dragon Ball Super and Dragon Ball Z? What are Frieza's slimiest moments? It is the BEST OF FRIEZA in Dragon Ball Super and Z! Hope you enjoy! The countdown in Broly is so freaking....I feel like tragic isn't quite the right word. If they'd combine that with that scene in the Bardock special, oh my glob, that would be such a super tragic, dramatic moment. Like you'd totally feel the full effect to the fullest. I am sucking at wording this right now. So, does DBZA cover the full scene for #9? Because I thought that seemed different in there. I rewatched that part not that long ago. I don't believe it, Freeza can't be you favorite character... Also, I'm blind to profile pics. Freiza destroying planet Vegeta is my favorite moment, it's legendary. My top iconic Frieza moments: 10. Frieza stabbing Krillin with his horn, stepping on Gohan's face, and beam-shotting Piccolo on Planet Namek. 9. Frieza torturing Vegeta. 8. Frieza killing Krillin and triggering Goku to go Super Saiyan. 7. Frieza revived and becoming stronger in Resurrection F through 4-6 months of training. 6. Frieza killing his soldiers for failing to beat the Z-Fighters. 5. Frieza powering up to the point where Goku, Vegeta, and others are in awe. 4. The Frieza and Gohan team up moments during the ToP. 3. Frieza destroying Planet Vegeta. 2. Frieza beating up the Universe 2 Yardrat and later betraying Frost. 1. Frieza punching Goku in the gut, claiming that his hand slipped. There are some others moments that I can mention, but I'll let this be the Top 10 list. With number 9 I was watching that scene and my Dad walks in and was like: wtf? 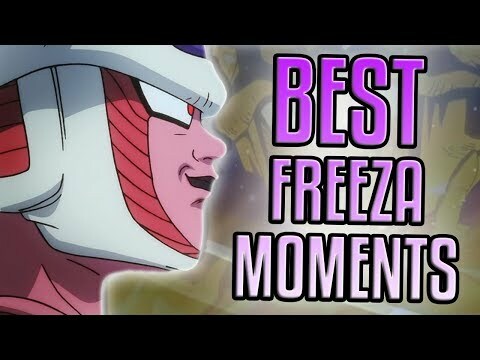 I feel like True Golden Frieza debut should have been on here somewhere but excellent video geekdom!